Very often, for our programs, we need a system to set parameters, usually of a numerical type. A 4×4 keyboard requires some space and then we also need a display. Here is the idea of using a touchscreen display to do both. I have then written the GetNum function that allows you to print a prompt message and to type an integer number. To test this function I wrote a simple analog data logger program that required two parameters, the first is the sampling period and the second the number of samples. In this example the number of channels to be scanned is set to three, but the program can be modified to request a third parameter with the number of channels. See the full post on ArduPicLab blog. 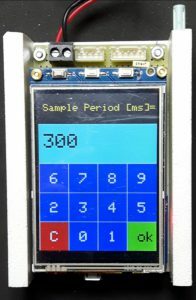 This entry was posted on Thursday, June 28th, 2018 at 11:21 pm	and is filed under Arduino. You can follow any responses to this entry through the RSS 2.0 feed. You can skip to the end and leave a response. Pinging is currently not allowed.